As part of my job as chair of the Department, I keep the stats on who takes our courses. I suppose that’s not really a requirement of the job, but I think it’s important to know how are classes are filling and whether that helps us better distribute courses across our departmental curriculum. 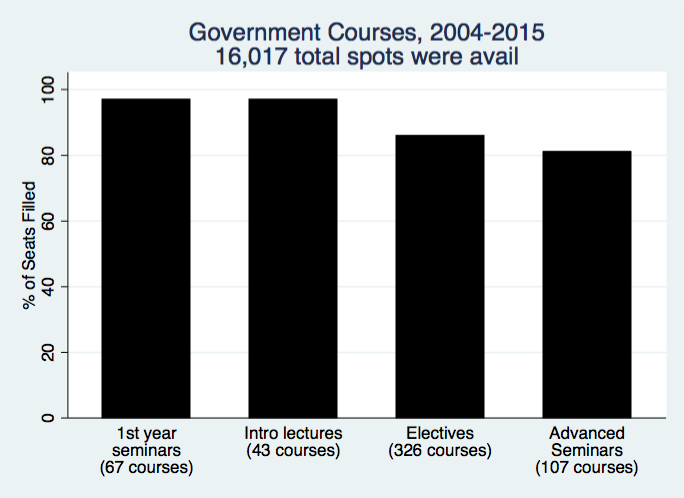 Below I show the enrollment numbers for our courses since 2004. Across our first-year seminars, introductory lectures, mid-level electives, and advanced seminars, we have offered students over 16,000 seats in our courses. (Bowdoin has about 1,700 students. Since 2004, these numbers suggest each enrolled student had about 1 unique spot open to them each year. That’s a lot of space for one department–a guarantee of 4 Gov courses for every student over their career at the College.) The graph shows the percentage of those seats that have filled. Pretty impressive, I must say.